Today’s Feast day St. Laurence O’Toole – A Holy Cross Window Saint ! Today's feastday belongs to one of our Holy Cross "Window Saints," whose beautiful image we will soon enjoy – St. Laurence O'Toole. We should probably establish some kind of tradition around the saints for whom we have images at Holy Cross. Let's pray about it. 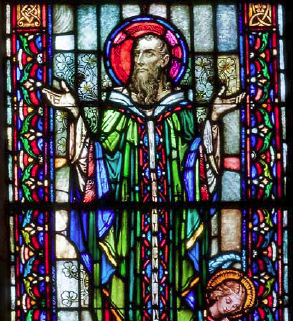 St. Laurence's window shows his episcopal crozier and his abbatial mitre – he was Abbot of Glendalough monastery and Archbishop of Dublin. He played a leading role in building the Church in Ireland, not only by physically erecting monasteries and churches, but by strenthening the holiness of the people and the prayerfulness of the liturgy. He was a great friend and helper of the poor. When urged by family, friends and monks to make a will when it was clear he was dying, he is said to have replied that he was joyful he had given everything away. I'm still researching the meaning of the "House of Gold" icon at the top of his window. If anyone has clues, please let me know. It is a term for Mary in the Litany of Mary. Eileen and Russell Johnston and family are the generous donors of the St. Laurence O'Toole window to Holy Cross Church. Let us pray that St. Laurence blesses their generosity in a special way today. Thank you to all the family members, friends and parisioners of Holy Cross who came to the 10 AM mass today, All Souls Day, to pray for the deceased members of our community and all the faithful departed. Our Bereavement Ministry along with help from others were not only welcoming, but prayerful and also helped serve up a delicious and convivial collation after the mass. Yesterday's list of God's creatures for blessing included: a gecko, a dwarf bunny and breeds of dogs large and small. We learned that bunnies will nibble on furniture and that one Golden Retreiver has learned to trick family members off the couch so he can have their spot! After praising God and recalling some facts about the life of St. Francis, we blessed our pets and asked God to help us be good stewards of all God's creation. Each pet was sprinkled with holy water. Home baked doggie peanut butter flavored dog treats and a commemorative ribbon of the day were distributed to all who came. 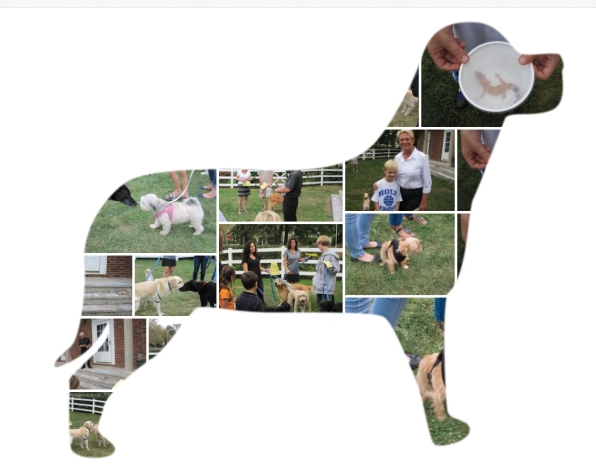 Don't miss this year's final St. Francis blessing of the animals on Saturday morning at 9:30 AM outside Holy Cross Chapel. Here is a recent tabulation of the Top Ten vote getters on our saint statue poll. 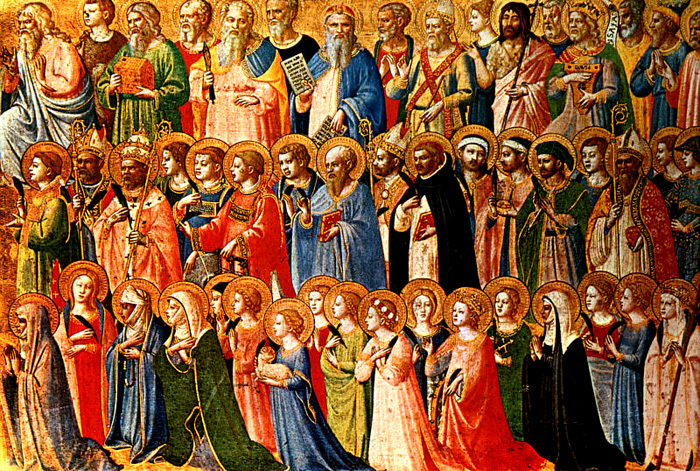 Interestingly, most of the saints suggested already have or will have a representation in iconography on our campus. Several have beautiful stained glass windows, St. Anthony already has a window and a statue. Except for the Sacred Heart of Jesus and the Blessed Virgin Mary who already both have new statues and windows, we will probably not duplicate a statue for any saint who will have a window in the church (unless of course, donor generosity provides for it). 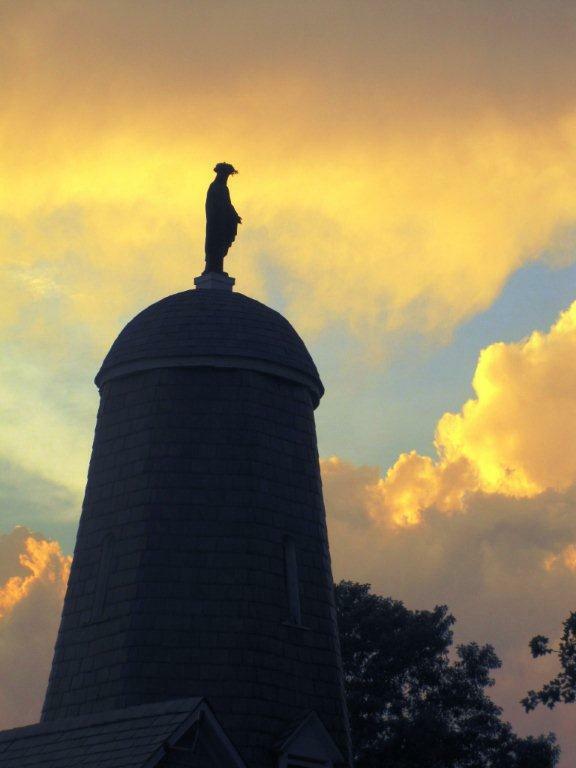 However, this ongoing poll will help coordinate our fund raising efforts and guide the choice of statues who will likely be popular. The survey is still available on the parish webpage. This post is late for her feastday, August 9th, but here are the notes I took from a reading of her life by Waltraud Herbstrith. Whether your contact with people comes through providing medical care, giving financial support or offering legal assistance, the possibility always exists for involving the whole person…This will impose an even greater burden on the capacity to love than a family does. Here, the natural ties are missing, the number of people is much greater, and, for the most part, they are men and women whose situation and current state of mind will tend to make them repulsive instead of attractive. 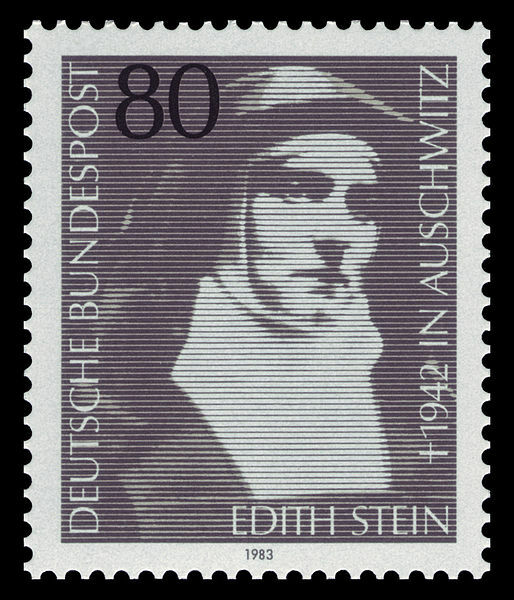 Christians themselves often have trouble understanding the value of a contemplative vocation; for the Steins, it was an impossibility. The day came when Frau Stein asked her daughter, "What do you plan on doing with the sisters in Cologne?" When Edith answered, "Join them," peace at home was a thing of the past. Everyone in the family felt crushed by the tragedy. Edith herself clung to her friends to keep from faltering in her decision; her mother, not daring to display her anger openly, wept in desperation; the brothers and sisters did all they could to change their sister's mind. "Why did you have to get to know him?" demanded Frau Stein. "He was a good man, I'm not saying anything against him. But why did he have to go and make himself God?" Help us select a list of saint statues to consider for inclusion in the niches on the church walls and the gardens surrounding the church. Posted in A Time to Build, Saints and tagged church statues, niche, prayer garden on March 13, 2013 by pastorholycross. Mass at 9 AM in Holy Cross Church. Halloween brings out the goblins, ghosts, skeletons and people even put fake tombstones on their lawns. It's no accident these macabre reminders of our mortality mingle with this year's most popular political leader or Hollywood star's image. Before people forgot about its sacred connection, Halloween unabashedly took us to the cemetery to help us bolster our faith in the power of Christ's resurrection, to pray for our beloved dead and to help us look death more squarely in the eye without fear. All Souls Day commemorates our beloved departed and encourages us to pray for the successful completion of their purgative journey toward sanctification with God. During the entire month of November, our Book of the Dead is placed in the Sanctuary near the Paschal candle. Parishioners are invited to inscribe the names of the deceased for whom they wish to pray, especially those who have died within the last year. 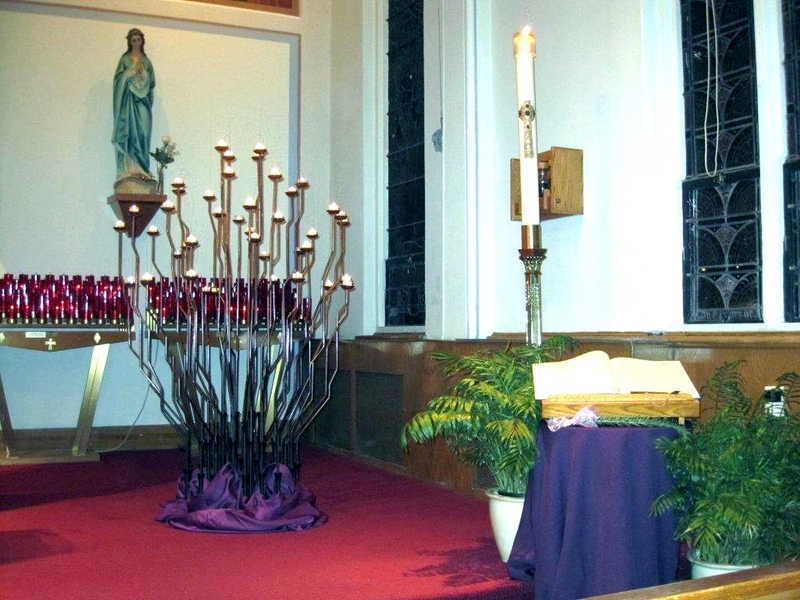 During a special memorial mass, family members of those departed whose Mass of Christian Burial was celebrated at Holy Cross light a votive candle in their memory and receive a hand crafted candle made from the molten wax of last year's Easter Candle. 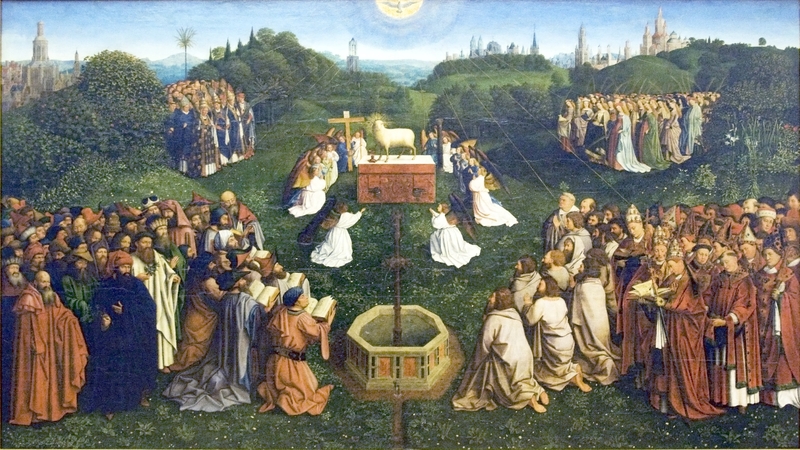 Our deceased are gone but not forgotten, still connected to us now and forever through the saving power of Christ's passion, death and resurrection. Pray with us during this liturgical season and enter the name of your deceased loved ones in our Book of the Dead.